JTT Autotech was started up by Jason Morfett and Martin Tagney after being made redundant from a Ford main dealer. They both worked there for 18 and 28 years respectively. They are both fully qualified technicians. They started up the company with a 3 bay workshop and employed an additional 3 people. Over the years, thanks to a loyal and growing customer base, JTT Autotech has doubled the number of workshop to six bays with the addition of a state of the art two bay MOT facilitiy. 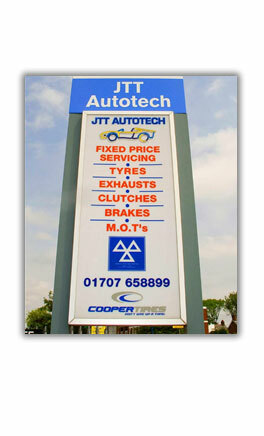 JTT Autotech now has 5 qualified MOT testers in total. JTT Autotech currently has a team of 10 people of which 5 are fully qualified technicians. All our technicians come from main dealer backgrounds. JTT Autotech also employ apprentices who are taken directly from local schools. Each apprentice is required to attend college once a week to obtain their NVQ and Motor Vehicle Studies. Collection and delivery drivers are available to help JTT Autotech to provide a better service to its clients. We also have a small fleet of courtesy cars available, subject to availability.